I really want to thank all of my fellow writers who submitted guest articles on such short notice. I still have a few more lined up through this week (and maybe a couple next week), but I wanted to show all of you why I needed a break from writing (even though I’ve been inserting a few of my own articles here and there). 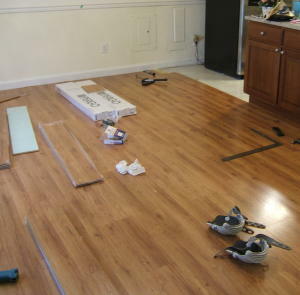 We bought the flooring back in April for almost $2,000 and had to wait till this past weekend until my father-in-law (FIL) could come down and install it. I almost said “so he could help install it”, but honestly it was almost all him. I tore out the old flooring, placed boards, and did the heavy lifting. Stacie helped with measuring and pulling staples from the old sub-floor (which is NOT easy). The “neighbor lady” helped move some furniture and pull up the old rug. And then my FIL did basically everything else. Why? Because he’s literally a master craftsman. He is a perfectionist when it comes to home repair/renovations and I trust his direction with anything related to home repair (and most car repairs too). Plus, he has the tools. I should add that the walls had a rooster wallpaper trim, with an ugly, nonmatching blue beneath and a lighter, still nonmatched blue on top. Now it’s a pale yellow on the bottom with a chair rail and cream on top (installed by my FIL, yet again). Although we’re not done yet, I can say a few things about the installation process. First, it’s not nearly as easy as just slapping down boards and locking them together. 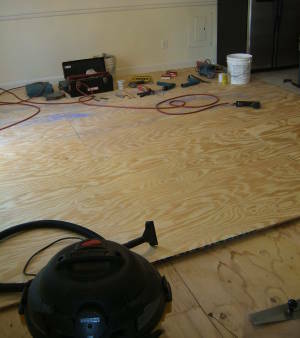 Even in a rectangular room, we had 2 doorways where we needed to cut out about a half-inch off the bottom of the frame on either side so the flooring could slide underneath (makes doing the base shoe easier). You can see the difference between the old and new subfloor near the vacuum. We were originally going to add 5mm board, but that would mean we would have to remove all the vinyl floor in the kitchen. 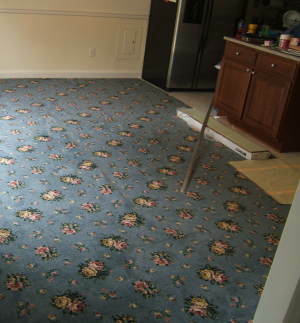 Instead, we boosted the dining room to the same height as the existing kitchen floor. In the kitchen itself, although not shown in these pictures, we had the challenge of a pantry closet with countless pipes and wires exposed, as well as a few more doorways that needed cut. My FIL spent a lot of time measuring and cutting, but eventually we got the flooring the whole way to our hallway. We had to stop at the hall because 1) too many doorways to cut and even bigger 2) we had to build a tiny ramp down from the kitchen vinyl to the hallway flooring. My FIL is going to use 5mm luaun board and feather it out over about 6 feet so you’ll barely notice the incline/decline when walking through that section. After we get through all the nastiness of the hallway (6 doorways), we’ll be in the homestretch of the front room. That room just has the front door to contend with, and we’re hoping no other surprises. You can see a bit of the kitchen (the fridge, the old vinyl floor before it was covered and the island). I think when it’s all done, I’ll post a couple more shots, but that won’t be for at least another 2 weeks. We were going to finish the floor this weekend, but since we didn’t get the ramp built, we’ll get to spend a relaxing Memorial Day weekend with my own parents (hopefully. My dad is sick right now). Wow thats a definite improvement – I’ve personally never liked carpets and I don’t know why people are so obsessed about them. I think you’ll see most of you investment back with interest when you decide to sell you house. Nice! Having been through numerous home improvement efforts, my hat goes off to you for undertaking this project. You’ll love the floors. I bet it feels good having got this chore finished at last. I bet it is even better knowing that you do some of the work yourself.